The ISEA Student Engagement Award was used to cover my transportation cost to attend The 8th Asia-Pacific Congress on Sports Technology (APCST) 2017. 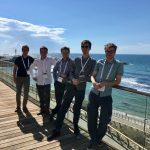 The conference was held on 15th to 19th October 2017 in Tel Aviv, Israel. The APCST is a major international event in the field of sports technology, organised biennially. 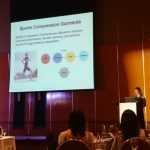 I had the opportunity to present my conference paper titled ‘Design of sports compression garments: exploring the relationship between pressure distribution and body dimensions’. The paper forms part of my PhD research on the design of sports compression garments for female athletes. I presented the results of an online survey that I conducted with sports compression garment users as well as key findings from my wearer trial study with commercial compression sportswear. My research is very interdisciplinary in nature and with a background in clothing and textile technology, it was imperative for me to strengthen my international connections in the sporting field. I really enjoyed that the conference featured presentations from both academia and industry. I learnt a lot from the academic presentations from a wide range of fields related to sports technology, such as sensors, wearable technologies, materials and sports equipment. These presentations were complemented by great keynote presentations from industry experts. 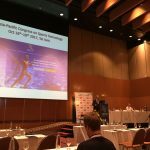 Yonatan Gorfung (Deloitte’s Innovation Tech Terminal) gave a very interesting presentation about future trends in sports technology, whilst Dr Matthew Nurse (VP / Nike Explore Team Sport Research Lab) and Dr Randy Wilber (US Olympic Committee) gave insights into the development and application of new technologies. 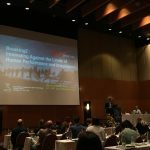 The common thread amongst these presentations was not to forget the end users in new developments – a principle that has always guided my research. Thanks to the support from the ISEA Student Engagement Award I fulfilled my aims of disseminating my research at an international level and broadening my network within the sporting sector. My focus is now on working towards the submission of my PhD thesis in early 2018. I look forward to meeting colleagues from the APCST again at future conferences to further strengthen relationships and potentially grow future collaborations.